A Grammy-award winning rap artist, poet, lyricist, and actor, Common is also a dedicated community activist who supports animal rights and HIV/AIDS awareness, among many other causes. He is the founder of the Common Ground Foundation, a non-profit organization that seeks to empower underprivileged urban youth to become strong and productive citizens. The foundation offers programs that foster the development of leadership skills, creative expression, and a commitment to education. Common engages audiences with stories of his childhood on the South Side of Chicago and the obstacles he overcame. Drawing upon his own hard work and path to success, he helps audiences understand how to strive for and achieve greatness by making a commitment to a greater cause. 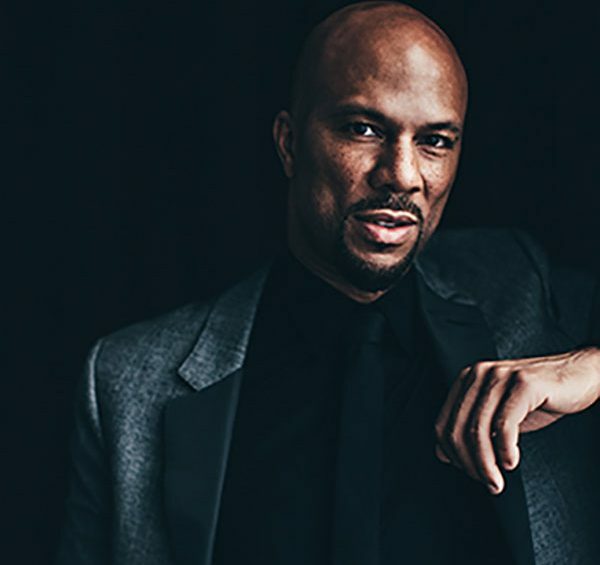 Academy Award, Golden Globe, Emmy and Grammy-winning actor and musician, Common, continues to break down barriers with a multitude of critically acclaimed, diverse roles and continued success at the box office. It was recently announced that Common has been cast in The Kitchen, based on the DC/Vertigo female-led comic book series alongside Melissa McCarthy, Tiffany Haddish, and Elisabeth Moss. Set in New York City’s Hell’s Kitchen during the 1970s, the story follows the wives of Irish mobsters (McCarthy, Haddish, and Moss) who team up to take over running the business after their husbands are sent to prison. Up next, Common lends his voice to Warner Brothers’ animated feature Smallfoot, in theaters September 28, 2018. The animated film follows a young yeti as he discovers a human. The film also stars Channing Tatum, James Corden, Zendaya, LeBron James, Gina Rodriguez, and Yara Shahidi. He is also set to star in Hunter Killer, an action thriller starring Gerard Butler, to be released on October 26, 2018. Later this year he will be seen in the Fox 2000 film, The Hate You Give opposite Amanda Stenberg, Issa Rae, and KJ Apa. This timely drama, directed by George Tillman Jr., follows a teenage girl who witnesses a white police officer shooting her best friend and is based on the novel by Angela Thomas. He will also be seen in Andrea Di Stefano’s action-thriller, Three Seconds, with an all-star cast including Clive Owen, Rosamund Pike, and Joel Kinnaman. He appeared on the big screen in the Oscar-nominated film, Selma, a film centered on the civil rights marches that changed America. Alongside John Legend, he won the Academy Award and Golden Globe in 2015 for “Best Original Song in a Motion Picture” for “Glory” which was featured in the film. In 2016, he appeared in David Ayer’s high-profile comic book movie, Warner Bros’ Suicide Squad. The film broke box office records both domestically and around the world. In 2017, Common starred opposite Keanu Reeves in the highly-anticipated sequel John Wick: Chapter 2, and appeared in Judy Greer’s directorial debut A Happening of Monumental Proportions with Allison Janney. This past summer he appeared in Bleecker Street’s Megan Leavey alongside Kate Mara, Tom Felton, Bradley Whitford, and Edie Falco. It was announced that Common will executively produce Black Samurai, a TV adaption of Marc Olden’s 1974 book series which inspired the 1977 film of the same name. He is set to star in Quick Draw, a new revenge/action thriller to be produced by Transformers producer Lorenzo di Bonaventura and Content Media. Behind the scenes, Common recently executively produced the Netflix drama Burning Sands and performed the closing credits original song, “The Cross” featuring Lianne Le Havas. The film premiered at the 2017 Sundance Film Festival and was released on Netflix in March. He currently serves as an executive producer of Showtime’s hit TV series The Chi, a coming-of-age story set in Chicago from Emmy-Award-winning writer Lena Waithe. Common’s eleventh studio album, Black America Again, was released November 4, 2016 on ARTium/Def Jam Recordings. The album includes the socially conscious new single, “Black America Again” featuring Stevie Wonder and the anthem “Letter to the Free”, the end-title track to Ava Duvernay’s powerful Oscar-Nominated documentary 13th, for which he also received the 2017 Emmy for “Best Music and Lyrics”. After collaborating on the album, Common, Robert Glasper, and Karriem Riggins joined together to form the supergroup August Greene. The trio made their live debut in January 2018 at New York’s Highline Ballroom as part of Glasper’s annual Grammy Awards party and will release their first joint album on March 9 through Amazon Music. Common was most recently featured on Andra Day‘s song for Open Road Films’ Marshall soundtrack, “Stand Up for Something,” co-written by Common and eight-time Academy Award-nominee Diane Warren. The original song has received Oscar, Grammy, NAACP, and Critic Choice Award nominations, as well as the “Hollywood Song Award” at the 2017 Hollywood Film Awards.